SARATOGA SPRINGS - In the banquet room filled with glimmering smiles and the glaring white beams of TV lights, the biggest and brightest smile was etched on the face of her husband, Jonathan Gillibrand, exalted, exhausted, and filled with complete joy. Kirsten Gillibrand's path to Washington, D.C., began quietly, taking a leave from her day job as a partner in a law firm to try to fill what she saw as a void in Congress. 'We need a voice in Washington that puts families first,' said Gillibrand, the Democratic political novice who on Tuesday unseated four-term U.S. Rep. John Sweeney, a Republican. 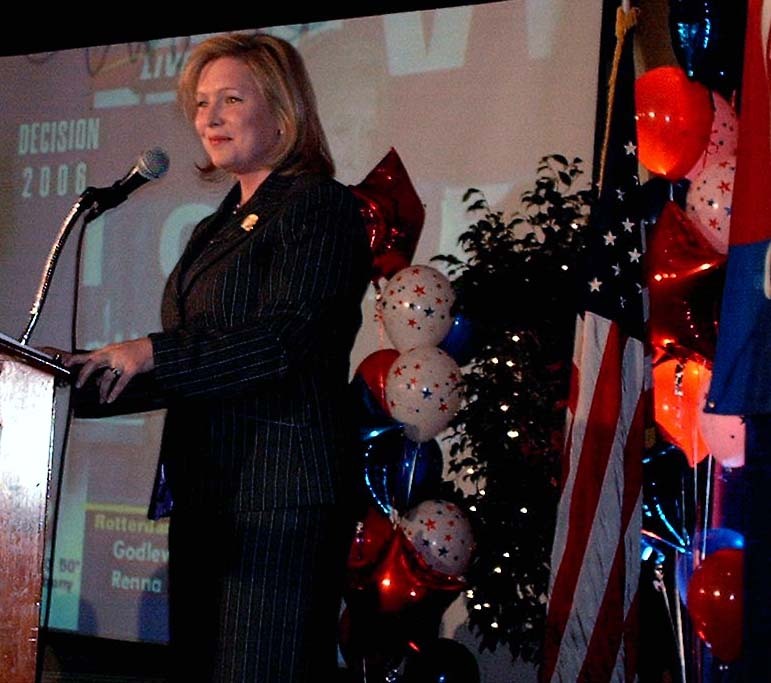 Early in the race, polls placed her well behind the incumbent for the seat in the 20th Congressional District, but Tuesday night, she stood on the podium in the banquet room of the hotel where the sweet smell of victory was hanging in the air. Just four months ago and a few yards away from the Gideon Putnam, Mr. Gillibrand - a huge Bruce Springsteen fan - and his wife attended a concert by 'The Boss' at the Saratoga Performing Arts Center. She began Election Day in the voting booth with her husband and young son at her side, then visited a high school in Hudson, where she spoke to a civics class. Many hours later, well-wishers awaited her arrival at the Gideon Putnam, the pumped up volume of Aerosmith, Blue Man Group and the theme from Star Wars rocking the grand ballroom in the state park on grounds inspired by Franklin D. Roosevelt when he was governor of the state. Now here she was, poised to take the seat out from under incumbent Sweeney. Much of the energy in the early days of her campaign was expended on raising funds for the race. It wasn't until much later in the season, well into the summer, when this region began to see her in person - at Democratic headquarters on Broadway, where she met with volunteers and well-wishers, at a 'debate' sponsored by the League of Women Voters at the Maple Avenue Middle School when the incumbent congressman claimed he had other commitments, at a Beekman Street art gallery on the city's West Side, where she told the gathering of the importance of the arts in rejuvenating communities. 'When we do win, each one of you can say you helped change the direction of America,' Gillibrand told them. Addressing the crowd from the podium just before 11 Tuesday night, she said she was grateful to all the women in the campaign - 'the sisters, the mothers, the daughters' - and to her husband for his support and to her grandmother, who inspired her at a young age in the political world of her upbringing in Albany. 'My grandmother, up in heaven, is watching us now,' she said. "This campaign was base on the idea that We The People should have a voice." 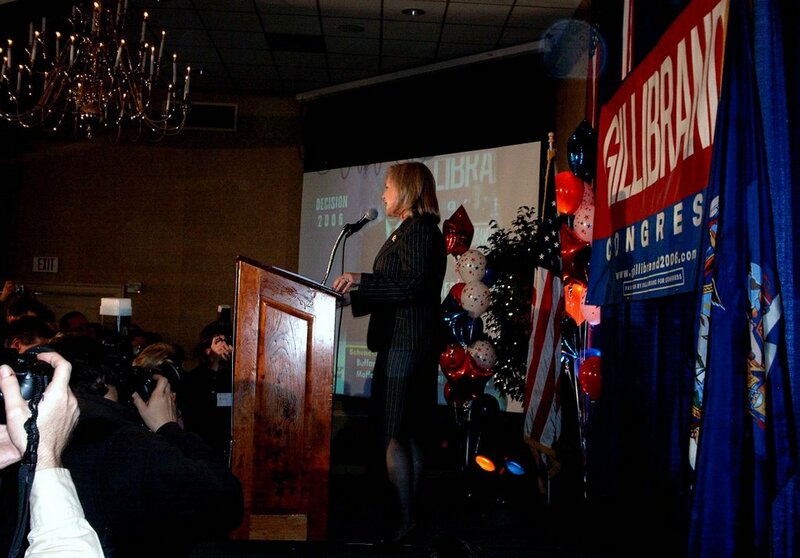 Then, at precisely 11:05 p.m., spokeswoman Allison Price came onto the stage and whispered into Gillibrand's ear. The candidate took a deep breath and glanced over at her husband. Then she moved back to the microphone. Mrs. Gillibrand is going to Washington. published in The Saratogian, Nov. 8-9, 2006. SARATOGA SPRINGS -A few weeks ago, J. Christopher Callaghan sat on a bar stool inside The Parting Glass where he was hosting a fundraiser for his campaign. A few miles north, up in Lake George, Comptroller Alan Hevesi was at a different event where he was apologizing for not reimbursing the state for using a staffer to drive his wife around. It was a week that marked the first time many outside Saratoga County first heard Callaghan's name as a political opponent to Hevesi in the state-wide comptroller's race. 'That was my favorite cereal growing up,' said Callaghan, responding to an inquiry of his choice of breakfast food. He also revealed his musical tastes, falling between 1940s Big Band jazz and a nostalgia for 1960s rock 'n' roll, particularly the sounds made by Brian Wilson and The Beach Boys. He is an avid reader of political biographies and history books about the Revolutionary War, and considers 'Casablanca' the best movie he's ever seen. Oddly, it is the classic wheat and malted barley cereal that seems to cross party lines this election season. 'My father liked Grape-Nuts and we used to share the cereal in my house when I was growing up,' said Kirsten Gillibrand, the Democratic challenger for 20th District Congressional seat. 'What I really liked when I was very young, though, was Cap'n Crunch. Later, as I got older it was Frosted Mini-Wheats,' says Gillibrand, reminiscing about her childhood in her campaign headquarters on Broadway in Saratoga Springs. 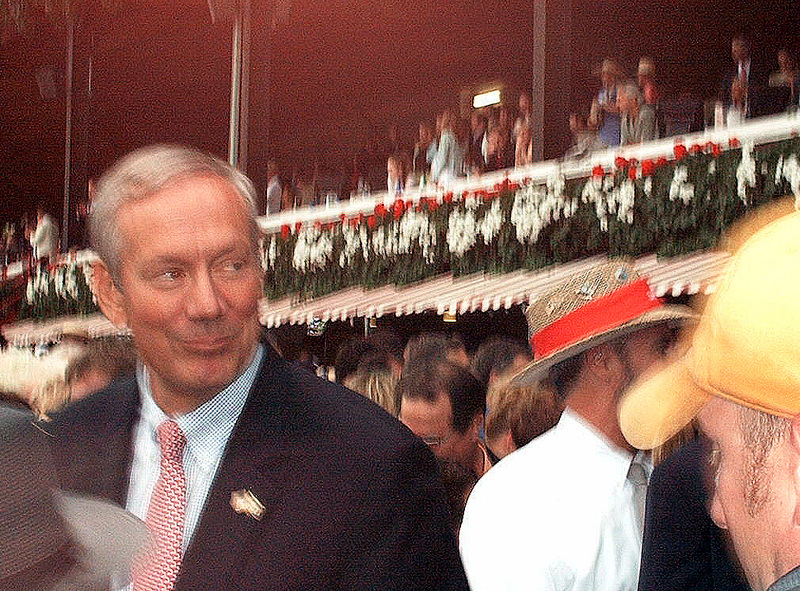 Gillibrand recalled her earliest concert at the Saratoga Performing Arts Center - The Doobie Brothers. The most recent was last June's appearance of Bruce Springsteen. One of her all-time favorites was seeing The Clash perform at the Glens Falls Civic Center, but she remembers the first concert she ever attended with a giggle that transcends to the time of grammar school. 'My first concert was seeing Cheap Trick at the Palace. All the girls in the seventh grade liked them,' she laughed. She likes swing music, and hums a few bars of 'Fly Me to the Moon' as proof, and enjoys listening to Sarah McLaughlin and U2. Gillibrand holds a special affinity from her childhood of The Spinners, whose tune 'Rubber Band Man' she recites verbatim: 'Hand me down my walkin' cane/ Hand me down my hat/ Hurry now and don't be late,' while accompanying herself with light percussive taps on a table top. Gillibrand sticks to the classics when it comes to films - 'It's A Wonderful Life' is her favorite - and describes herself as a 'nerd' when it comes to reading volumes of political biographies. She spends her TV time these days watching shows like '60 Minutes' and 'Meet the Press,' years removed from childhood memories of 'Gilligan's Island,' 'The Partridge Family' and 'The Brady Bunch,' where her favorite, she said, was 'the middle one - Jan.' And if there were a TV movie made about her life, Gillibrand said the actress she would want to portray her is Jodie Foster. 'She seems like me - serious, and policy-focused,' she said. In the battle for the 110th Assembly District, Republican incumbent James Tedisco is facing off against Democratic challenger Michael Eidens. At the age of 56, they were born from the same era, but differ in their politics and their pop-culture favorites. Tedisco votes for the silver screen classic 'Butch Cassidy and the Sundance Kid,' based on Paul Newman's talents. Eidens is a big fan of Woody Allen movies. 'Superman' and 'The Honeymooners' were TV favorites in the Tedisco household, whereas Eidens was into sports. Eidens is a classical music fans these days, light years from the first concert he ever attended, The Doors in New Haven, Conn.
Tedisco's first concert was James Taylor. Today, he enjoys listening to country music and soft rock. When asked who they would choose to portray them in a movie of their respective life stories, Eidens likes comedian Larry David. Tedisco's choice is Robert De Niro. In the race for the 112th Assembly District, both candidates are musically aligned with the classics. If he had to choose, Democratic challenger David Carter said musically he is a fan of Frankie Valli and The Four Seasons and Queen; he most enjoyed reading 'The Hobbit,' and grew up eating Raisin Bran and Frosted Flakes while watching shows like 'Superman,' 'Father Knows Best' and 'Laugh-In' on television. Given a choice, Carter would pick Michael Douglas to portray him on the screen. 'He has played some adventurous roles and I think I've lived a pretty enlightened life,' Carter said. In the McDonald household, there were two cereals. 'It was either Corn Flakes or Cheerios and I enjoyed eating those as a snack food the way like people to eat potato chips,' said McDonald, who grew up in the age of early space exploration, which inspired his interest in watching things like 'Star Trek' on TV. 'Astronauts were big stuff when I was a kid. It was the time of John Glenn and space travel and searching the stars for an adventure,' McDonald said. If there was a TV movie made of his life, McDonald said picking the lead actor for the role would be easy. 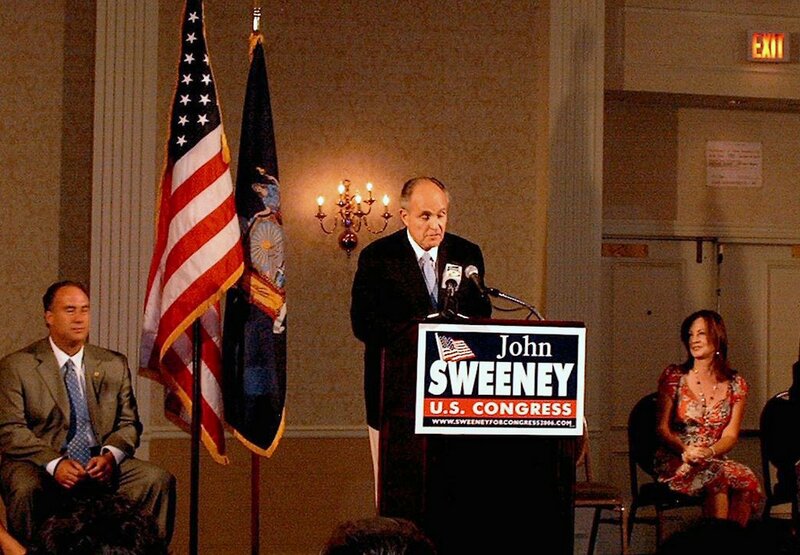 (Congressman John Sweeney and Comptroller Al Hevesi did not reply to requests for their favorites).